Hi, friends! Just a little announcement that I’m guest posting over at 11 Magnolia Lane today! 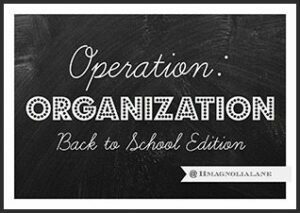 Be sure to click on over to say “hi!” and catch up with their Back-to-School Edition of their Operation Organization Series. Fun stuff! As always, a great time was had by all. Click here for more party inspiration that Denise has put together in the past. And for all of you who have asked about and prayed for her during her treatments, thank you! It means a lot to her and it means a lot to me. We’re looking forward to it all being behind her and life getting back to normal, however crazy and abnormal that may be! This entry was posted in Uncategorized and tagged Denise's Parties, Parties, Summer. Bookmark the permalink. Follow any comments here with the RSS feed for this post. Post a comment or leave a trackback: Trackback URL. What a lovely party, and what an inspiration Denise is! Thanks for sharing–and thanks for guest posting today over at 11 Magnolia Lane! That looks like so much fun! It probably makes your sweet friend feel better to do regular things like that too. Yes, it's definitely good therapy for all of us!! What a fabulous idea for a party and her decorations are wonderful. Wow! Such a fun party and all the decor is fabulous. Denise is very strong to pull this off in the midst of chemo! I will remember her in my prayers.